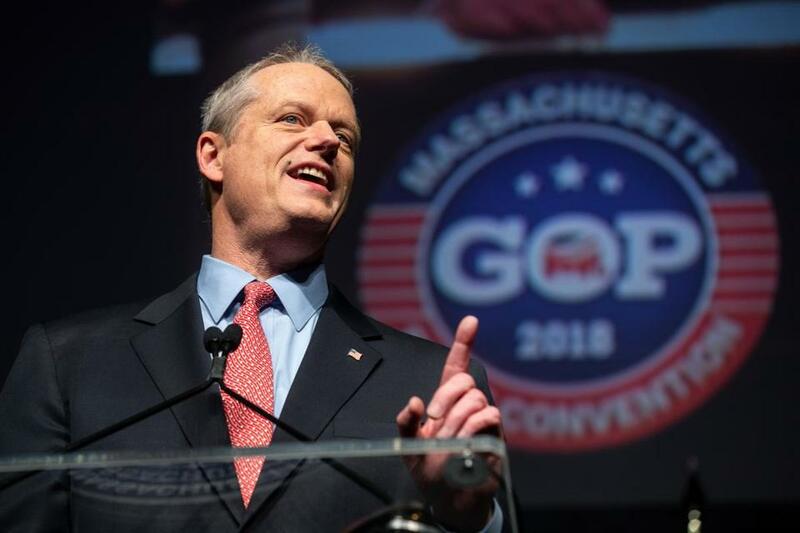 Governor Charlie Baker spoke during the Massachusetts GOP State Convention held at the DCU Center in Worcester in April. He’s signed bills, dueled lawmakers on amendments, and waited as the Legislature hustled into the wee hours of August to finish its formal business. But while Governor Charlie Baker has remained ensconced on Beacon Hill, his campaign machine has quietly hummed inside its Allston headquarters, building a staff of dozens and reserving swaths of air time as it prepares to jump-start his reelection just weeks before the Sept. 4 primary. A Republican-backed super PAC that poured millions into Baker’s 2014 victory is splashing a cheery, 32-second spot across local televisions, touting his lofty polling and the state’s humming economy. The outside group, known as the Commonwealth Future Independent Expenditure PAC, spent $11.7 million on ads on his race four years ago, fueled predominantly by donations from the Republican Governors Association. A spokeswoman for Commonwealth Future, Jamie Rhoades, declined to say how much the RGA has contributed this cycle or how much in ads it has committed to Baker’s race. But the number is expected to be significant. According to a Democratic media consultant who’s reviewed recent ad buys, the PAC has reserved approximately $5 million worth of cable and broadcast air time through October — a substantial amount, especially when combined with $4.3 million Baker’s campaign itself has reserved. Baker has said for months he expected to avoid the campaign trail until August while the Legislature wrapped up its formal session. But there’s been little to push him there, too. He faces a long-shot challenge from Scott Lively, a conservative, pro-Trump pastor from Springfield who muscled his way onto the ballot at the state Republican convention. Recent polls also had Baker holding commanding leads of up to 40 points over Jay Gonzalez and Bob Massie, the two Democrats running in the gubernatorial primary. It’s made for a sleepy race. But behind the scenes, Baker’s campaign payroll has swelled to 29 paid staffers, far more than the dozen or so he reported paying in the run-up to the 2014 primary, according to campaign finance records. Baker has also continued an aggressive fund-raising operation, driving his bank account to $8.4 million by the end of July. His running mate, Lieutenant Governor Karyn Polito, has another $3.7 million. Massie, meanwhile, has $109,000, thanks largely to $137,270 in public financing he received earlier in the month. Gonzalez has $431,000 on hand, after getting even more — $290,362 — in state election funds. The lack of a campaign trail presence, however, has left Baker to define his campaign in intermittent strokes, such as in a speech at the state Republican convention or in snippets during hallway interviews at the State House. The PAC ad, while by law is produced outside the campaign, provides a glimpse of the type of pitch voters could hear through November, including a heavy emphasis on polls that land Baker as the country’s most popular governor. The message, including its messenger, echoes the PAC’s first efforts to help lift Baker into the corner office; Lutfy-Grome appeared in one of the group’s ads four years ago, too. She also was quoted in a 2016 story as enthusiastically supporting Trump, telling a local newspaper that she “can’t wait for the wall” and calling his election a chance to “clean house” of establishment politicians. Baker, a moderate Republican, has regularly criticized the president. Efforts to reach Lutfy-Grome were not successful Friday. Chris and Lisa Collins, who contributed a combined $10,000 to the PAC in 2014, are both donors again, and the latter appeared at the end of the ad as the PAC’s new chair. Jennifer Nassour, a former chair of the state Republican party, also contributed. The exact amounts of their and the Republican Governors Association’s donations are not yet known, as state law allows a PAC seven business days from when its advertisement appears to publicly disclose its expenses and donors. Four years ago, the RGA contributed a total of $10.75 million to the PAC, according to state campaign finance records. When he has pitched his accomplishments, Baker has pointed to the relationship he’s built with Democrats on Beacon Hill, saying that approach has helped push through priorities, such as expanding the state’s Earned Income Tax Credit, which helps the working poor, and taking a harder line against drug dealers. “As the fall approaches, Governor Baker and Lieutenant Governor Polito look forward to building on their proud record of bipartisan, collaborative leadership that continues to deliver results for the people of Massachusetts, and earn the support of voters across the Commonwealth,” campaign spokesman Terry MacCormack said. In 2014, outside groups also buttressed Baker’s opponent, Martha Coakley, including another super PAC known as the Mass IEPAC, which spent $6.3 million on the race. The Democratic Governors Association, the RGA’s counterpart, committed $1.4 million. But it’s unclear to what degree other PACs or the Democratic Governors Association will be involved this year. Massie, for one, said he would disavow any support from super PACs, according to his campaign. Gonzalez’s campaign, too, whacked Baker for the ad, noting the governor’s unique joint fund-raising operation with the Republican National Committee regularly funnels cash toward the national GOP.